Winter is officially about to start, although it well and truly feels like it's upon us by the time November rolls around. Short days, lots of rain and a wintry chill can leave us all feeling a little miserable. So why not swap it all for some winter sun? There's only so long that open fires can keep us warm! A November villa holiday is your chance to grab some Vitamin D and maybe even top up your tan on the beach. There's plenty of places for you to soak up that winter sun too. Take your pick from the Canary Islands, Caribbean, Cyprus and lots more. Find your perfect November villa holiday right here. Forget about fireworks night! Swap standing in a cold field for the feeling of sand between your toes, with a November villa holiday. This is your chance to grab a slice of winter sun with a sea view. Wouldn’t you rather be basking in the warmth, watching waves lapping the golden shores? Popping your flip flops on as you head out the door - not your winter boots. We’ve picked out some of our top destinations for a November villa holiday. They’re all just a short flight away too, so you could be topping up your tan in a matter of hours. The tourist season has finished winding down at this popular holiday destination, so now is your chance to get a taste of the authentic Algarve. Pull up a chair and prepare for some first-class people watching. With the crowds dispersed, life resumes at the local pace. Although you might catch a few glances, wearing your t-shirts and shorts. The average monthly temperature of 23°C might feel positively tropical to us, but this is big coat weather for residents of the Algarve! Cooler than the summer months, November is ideal for exploring the natural beauty of Algarve on foot. The countryside comes alive at this time of year. Beautiful flowers begin to bloom and blossom, making a stroll among the greenery a must for nature lovers. Carrying your clubs is a lot more comfortable too! 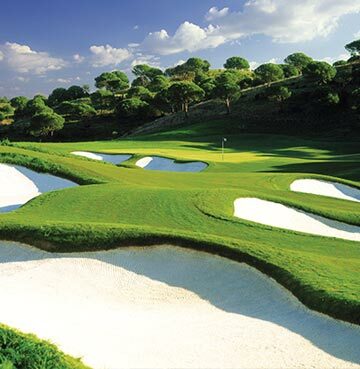 So keen golfers will love teeing off in the Algarve – home to a number of Championship courses. Why not get a head start on your Christmas shopping? You might be escaping the winter chill, but the Algarve’s markets might prove too hard to resist. Pick up some presents with a Portuguese twist! Perhaps some local cork creations or some tasty treats might tempt you? Just remember to save some space in your case. Monthly markets take place in plenty of towns, so if you’re a bargain hunter be sure to locate your local shops and stalls. This Canary island bathes in year-round sun, so there’s no limits to what you can do on your November villa holiday. The glorious sunshine makes exploring and adventuring a treat. Which is just as well because when it comes to the great outdoors, it doesn’t get much greater than Lanzarote. The volcanic landscape at Timanfaya is one of a kind – with mountains to climb and craters to explore. Head underground and there’s lava-shaped caverns to discover too. Alongside the impressive rock formations, the Cueva de los Verdes has a fascinating story to tell. How amazing would it be to spend your November kicking back on the beach? Soaking up the sun, swimming in the sea – it beats getting caught in a heavy downpour! And when it comes to stretches of sand, Lanzarote spoils its visitors. Papagayo Beach is picture-perfect. This sheltered cove is a beautiful blend of golden shores and turquoise waters. But if you’ve never set foot on black sand, Playa Quemada needs to move to the top of your to-do list. This beach is a favourite for locals, who come here for tranquillity and a refreshing swim. This is your chance to top up your tan, far away from the grasp of tourism. It’s not all hiking and sunbathing – Lanzarote packs a cultural punch too. 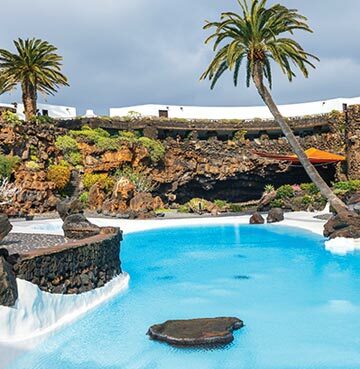 The island is the birthplace of renowned artist César Manrique, so be sure to check out some of his work while you’re here. There’s no better place to get a feel for his artistic vision than the Jameos del Agua. Where the lava tubes and volcanic tunnels were transformed into a magical concert venue and inviting gardens. Need a little more culture? Or some history thrown in too? Fill your boots in Arrecife! Where the Castle of Saint Joseph is the undisputed jewel in the cultural crown. Overlooking the sea, it was once used to defend against marauding pirates. But by the 1970s swashbuckling invaders were no longer washing up on Lanzarote’s shores. So Manrique converted the magnificent castle into the Museum of Contemporary art, capturing old and new in this wonderful building. With an average monthly temperature of 23°C the beaches are by no means out of bounds on your November villa holiday. But the cooler climate offers a great opportunity for cultural exploration. And when it comes to Cypriot history, charm and tradition there’s nowhere better than Paphos. Expect to be impressed, it was deservedly crowned European Capital of Culture in 2017. 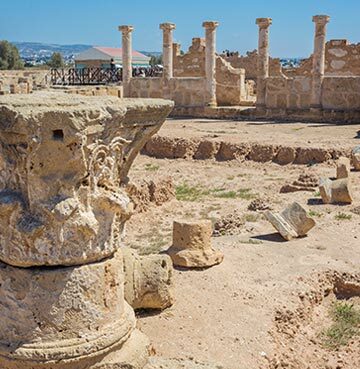 The Kato Paphos Archaeological Park is a treasure trove of historical delights. Roaming through the Roman villas is heaven for history buffs, with mosaics and artwork telling tales from Greek mythology. You’ll also discover ancient entertainment and means of protection on your visit here. The Byzantine castle was once used to guard Paphos from invasion, while the remains of the theatre let you stand where ancient actors once performed. Nearby you’ll find the fascinating Tombs of the Kings. But before you start worrying about whether you need to bow or curtsey, you should know that these were actually the resting places of aristocrats and important government officials. It’s the grandeur of the tombs that has given them this regal title. The elaborate designs have stood the test of time and these works of art are just as impressive today. There’s more culture and ruins to be found just along the coast. And close to Limassol you’ll find the remarkable remains of Ancient Kourion, where the 3,500 spectator amphitheatre is the undisputed star of the show. Its impressive condition and breathtaking sea views ensure that it tops the bill for many visitors. While Roman villas, mosaics and public baths all play their part in an amazing day trip here. A leisurely stroll in Limassol Old Town would be the icing on the cake. A 14th century castle sits at the centre of the labyrinth of winding streets. Marvel at the traditional buildings before grabbing a table at one of the amazing cafés or restaurants – the perfect place to watch the world go by.